What pastel fantastic-ness!! Photographer Louise Walker has spun up a series of hair portraits she calls "Wooly Head." It turns out that Ms. Walker is not only a photographer but also a master knitter! It's hard not to feel sweet for these doll-like ladies. 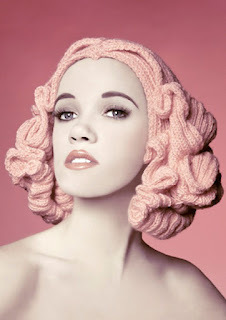 Each knitted wig is a sculptural feat, representing a different era and she's even documented her technique and process on her blog. "I used a lacey stitch to get the wave initially running through the piece. I knitted it long enough to double it over then stuff and sew into place." "The hair piece was baby blue, inspired by the 1950s and Katy Perry's use of the eras styling." "I liked the loose curls in the hair and didn't want to recreate the finger wave I had done for the 20s look. I went for a middle parting in coral red wool...I think the hair piece could have been better. It needed more volume on the top, and if I had made longer pieces I could have doubled them up to make them visually stronger"
Hi, I saw your "pink hair hat" and I would like to knit one for someone who will absolutely were it. Is it possible to buy the pattern from you ? Thanks for your response and I wish you a great holyday 2014.